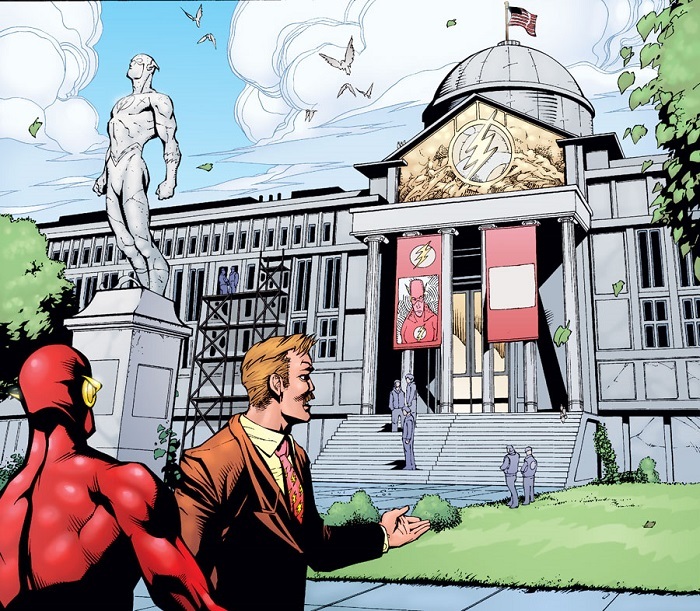 Today’s strip was not available for preview, but I think we can safely guess that it will feature Pete extolling the many wonders of the Flash Museum in Central City. This is just TB admitting that he knows no one reads FW and that he just doesn’t care. One day he decided the “Flash museum” had to be featured in FW and here we are, mission accomplished. Unless you read his strip and his blog regularly (and who does?) you’d have no earthly idea what the hell is happening here. And even if you do the whole thing is kind of hazy. This is Batiuk at his self-indulgently lazy worst, another vanity project premise he couldn’t be bothered to expand upon in any meaningful or entertaining way. Two characters say they’re going to a “Flash museum” and bam, there they are. Too bad he wasn’t so succinct while Lisa was dying or Darin was opening mail. Someone over at Batom Inc. HQ really needs to forbid “Flash” comics until after he finishes the word balloons and washes his hands, because this is ridiculous. For those who thought that “marching band” was too niche a topic for a nationally syndicated comic strip, we’re into week 2 of an arc about The Flash. It’d be a fun project to figure out exactly how many times commenters have described something as “Batiuk at his worst”. An awful awful lot. You know what would be kind of cool, if you were a fan of something, and an artist? To create your own art as an homage to it. What wouldn’t be cool is literally Photoshopping your own characters into someone else’s work, though. Really, it reminds me of someone editing a clip of themselves in a Starfleet uniform into an actual Star Trek episode and then bragging to everyone about it. I get it now. The Flash Museum is a “gentlemen’s club” – all naked, 24/7 – and discotheque. Pete and Durwood are about to embark on a journey of pleasure wholly unknown to anyone from Westview. That is an impressive shoebox diorama… or are we supposed to believe that is actually Pete and Durwood and not two popsicle sticks dressed up like Pete and Durwood? spacemanspiff85: He has so many varying degrees of worst. There’s boring worst, self-indulgent worst, maudlin worst, baffling worst, lazy worst, pointless worst, annoying worst…it goes on and on. This particular arc is definitely self-indulgent and lazy to a remarkable degree. He desperately wants to shoehorn his current comic book obsession into the strip, then does it via a laughably inept “story” he couldn’t possibly have put more than thirty seconds of thought into. Even his personal pet interests and passions don’t inspire him to crank out anything but intelligence-insulting dreck, makes you wonder why he even bothers anymore. The problem is even worse. DC doesn’t give two shits about his copyright infringement because they know that the only people who read his garbage are a bunch of people on an on-line community that talk about how lazy he is and how terrible the strip is. Unless you share Batty’s interests in cancer and comic books, you won’t get anything out of FW. This strip is about Batty chasing awards and indulging his own interests, and that is it. If you are looking for a strip that provides laughter, even when discussing serious topics, and nice artwork, then read some Calvin and Hobbes collections. If you must read something new, then Bloom County 2017 will reward you similarly. 1. graft FW into the DC universe by having the museum be identical to the one in the comics, i.e. dedicated to the Central City superhero? 3, do none of those things and just have them approach the building enough so that he can photoshop some comic book art in as banners on the front, followed up by a panel with Pete and Darin back at Montoni’s telling how awesome it was? I vote for the third alternative. @billytheskink That is an impressive shoebox diorama… or are we supposed to believe that is actually Pete and Durwood and not two popsicle sticks dressed up like Pete and Durwood? You’d think Burchett would use this visit to a fanciful, comics-inspired locale as a chance to show off his Eisner-winning pencilling skills..his “museum” looks like a bland, windowless concrete bunker, wheras in the DC universe it looks like a pretty classy place. well it took the new “artist” about three weeks before he realized he could just mail it in and still get paid. Well, I was expecting the museum to be a fan boy’s garage with a bunch of shrink-wrapped comics and a big plywood lightning bolt spray painted gold, so today’s strip certainly exceeded my expectations. Just nitpicking I know but lord isn’t a thin looking multi story tower just the tiniest bit impractical for a museum? Think of all those comic book fans trudging up and down those steps and the picture gets even worse. I don’t know how many times over the last month I’ve read FW and thought, “I don’t get it.” This strip is more esoteric than a Dennis Miller punchline. I suspect that more people still read The Flash and know who he is than still read Funky Winkerbean and know who he is. That makes for a pretty thin slice on the Venn diagram. So, how soon before somebody wakes up?